Using Essential Oils for Children is a beautiful way to take care of your children’s health. They support immune health and do not have the unwanted side effects. Essential oils for Children are comforting and soothing. They allow you to nurture both the physical and emotional aspects of your children’s health in a truly holistic way…through fragrance and touch. These beautiful oils are natural “plant based medicine” and they work with your child’s body to strengthen and support health. They are useful in supporting immune health, for the minor day-to-day aches and pains, cleaning, even cleaning and purifying the air. 4. Use only certified pure, therapeutic grade, essential oils. This is important! Click Here To See "List of Safe Essential Oils for Children and Babies"
Dilute the essential oil with a vegetable (olive oil) or carrier oil before applying. This will help to avoid skin sensitivity but will not reduce its potency. Massage 2-4 drops of the diluted essential oil into the bottom of the feet. Watch for irritation and redness. If irritation should occur, wipe off with a vegetable or carrier oil. Do not use water! Water and oil don’t mix, it just spreads the oils. Most children respond extremely well to oils without any problems. If your child has sensitive skin or is prone to respiratory sensitivity, the feet are the safest place to use oils. In fact, due to their large pores, the feet are an effective place to use oils on any family member. If you have safely tested an oil on your child’s feet, you can test it next on the inside their arm, just above the elbow. Once you have tested an oil on your child, without any reaction, you can apply it to other areas of the body, such as the back, behind the ears, neck, etc. Basically, Essential Oils for Children can be applied to most areas of the body, as long as they are diluted. The exceptions are the eyes, nose, and inside the ear canal. 4. Do not get the oils close to the infant’s eyes, nose or mouth. Essential oils for Children support health on many levels, including physical, emotional and spiritual. Massaging these oils, into the bottom of your child’s feet, can be a pleasurable experience that not only comforts and soothes but enhances bonding. Science has proven that touch, in itself, is very healing. A loving touch boosts the immune system and is comforting and relaxing. When you combine touch by massaging essential oils into your child’s body you create a powerful, immune supporting energy. 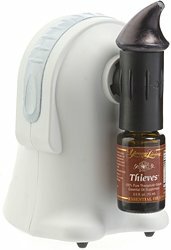 Essential oil diffusers create a micro fine mist that can suspend these healing oils into the air for hours. This is an effective way to get these oils into your children’s respiratory system, and throughout their entire body. When the oils are breathed in through the nose, they enter into the lungs and are absorbed into the bloodstream. They travel throughout the body to help support the immune and respiratory systems. This can be extremely therapeutic. For additional immune support, we run the diffuser in the bedroom, while they sleep at night. I highly recommend you try it…you will be amazed! Tea tree oil (melaleuca alternifolia) and lavender diffused together help to support the lungs. If you have children in school, their immune systems can easily become stressed, especially during the cold months. Diffusing essential oils offers support for a healthy immune system, in addition to lungs and sinuses. Infant’s lungs are much more sensitive than adults or children. Some oils could cause discomfort. I recommend a very light, intermittent, setting on the diffuser, to see how the baby adjusts. Another option is to diffuse for only five minutes, then wait an additional 15 minutes, before bringing the infant into the room. This is even more important in small rooms. Our babies and infants have done well and they have benefited from diffusing. Some oils like cinnamon, oregano, and peppermint are very strong and it is recommended not to diffuse them until they are older. Instructions are included when you purchase a diffuser. I personally prefer the ultrasonic diffusers that have a timer. Remember that diluting Essential Oils for Children before application is highly important for their safety and for comfort. Return to home "Essential Oils for Families"
and click the "Like Button"
There are many ways to experience the benefits of aromatherapy and essential oils. The three basic uses or applications are topical. . .
What are essential oils? Believe it or not most of us have experienced the incredible power of essential oils with out even realizing it. How to use essential oils depends on the essential oil and you. There are 3 general methods of applying essential oils to the body. An essential oil diffuser is a perfect way to improve your home, work, or living environment. They provide more than fragrance. They support whole body health, including the respiratory system. Essential Oil Safety is a guide for the whole family, including infants, children, and pets. Follow these simple “safety guidelines” to enjoy the health benefits of therapeutic aromatherapy. Using Essential Oils for Children is a safe and beautiful way to care for your children's health, naturally. Come join us and learn how we use them on our babies and children. There are two ways to buy essential oils from Young Living. Let’s see which method best fits you and you lifestyle. A collection of Young Living Video's describing the benefits of Young Living Essential Oils, including company, products, business building, science, etc. Young Living Essential Oils offers the purest essential oils, essential oil blends, and essential oil enhanced products to safely and naturally boost and maintain your family’s health. These statements have not been evaluated by the Food and Drug Administration. In strict accordance with FDA regulations the information and products on this website are not intended to treat, cure, prevent, mitigate or diagnose any illness or disease. Copyright 2014 Essential Oils for Families.com All Rights Reserved.